Closing a message removes it from active status and, if archiving has been set up in the Message Editor, sends it to the Archives. Messages that do not have archiving set up will disappear when closed. Closing a message will also stop any additional features of the message, including text or media on signs, signal light flashing, etc. 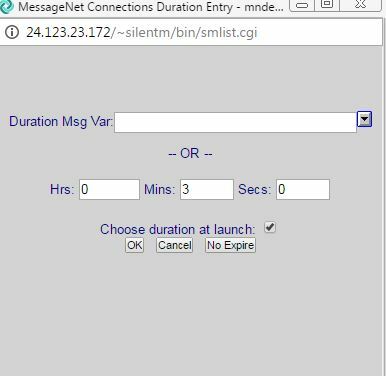 Messages can be closed manually via the Inbox or Stop Active Messages, or automatically via duration or by another message with a command list. There may be limitations to who is allowed to close certain messages, depending on user class and other restrictions. Click the checkbox next to the message you want to close. The screen will then refresh. Note: MGR users with access can use the arrow button to navigate to another user’s Inbox and follow the steps above to close messages sent to someone else. 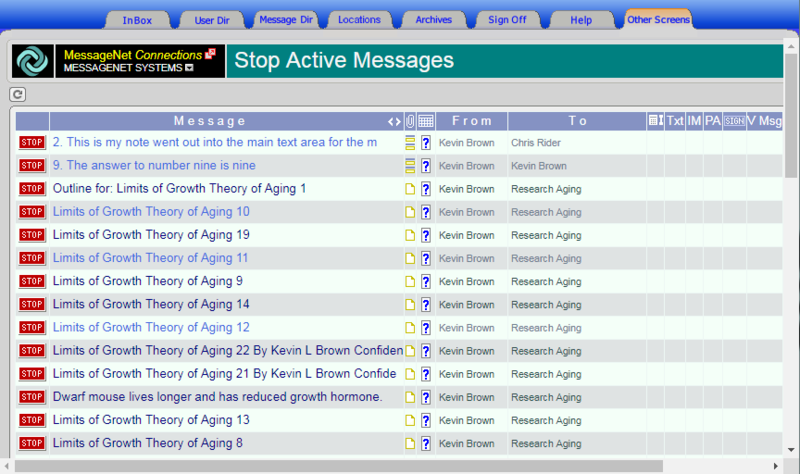 Click on the Other Screens tab and select Stop Active Messages. Click the button next to the message you want to close. Note: MGR or AMG users can close any active message from the Stop Active Messages screen. Users of any other user class can close only messages that also appear in their Inbox. Use the button next to the Message Duration field to open the Message Duration pop-up window. Enter the hours, minutes, and seconds you would like the message to remain active, and then click OK.
Click the check box if you want the option to change the message duration when the message is launched. Click No Expire to have the message active until manually closed by a user or closed by another message. Messages can be closed by another message, which will require set-up in both the message that will be closed and the message that closes it. 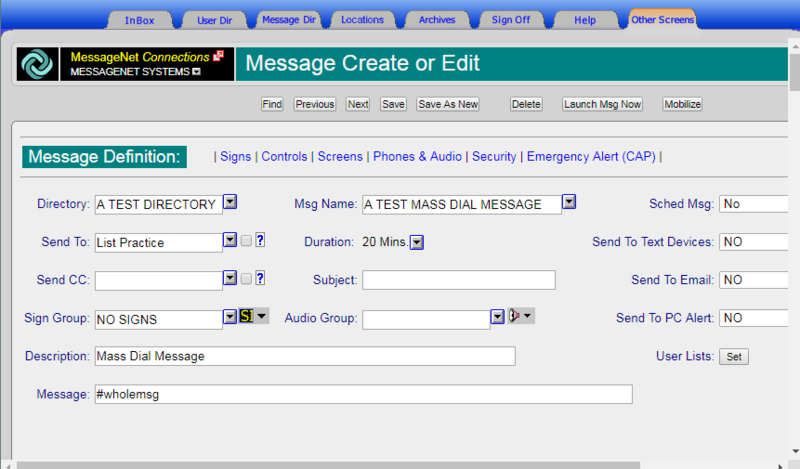 First, navigate to the Message Editor for the message that will be closed. In the Label: field, enter an appropriate label name of your choice and click Save at the top of the message. Note: This feature closes all messages with that label, so any messages containing that same label will also be closed. Next, navigate to the Message Editor for the message that will close the other. Scroll down to the Command List and click on the icon, which will open a the Command List screen in a new window. Click Save at the top of the Message Editor. Scroll down again to the Command List field and it will now say Exists next to the icon. Recent emergency events such as school shootings have shown that emergency communication systems need to be more than just audio PA because a fire alarm can drown out an audio announcement. An emergency communication system needs to be both text and audio, as well as have cameras and signal lights to be more effective. But putting all of these different types of devices and systems into an organization can be prohibitively expensive. That’s why MessageNet is introducing the new Omni device – an all-in-one room appliance that is designed to have all of these features and more in one low-cost, easy-to-install device. The Omni comes with built-in flashers, a high-definition LCD screen, speakers, and a camera. It can connect to external devices such as wireless panic buttons via Bluetooth. It’s easy to install – it mounts on the wall and doesn’t require pulled cable because it plugs in with a PoE power injector that plugs into the wall and connects to the network wirelessly, although a wired Ethernet option is available if desired. It can even plug into a dedicated LCD via HDMI to project the contents of the built-in LCD onto a larger screen. The Omni also has a built-in battery backup so that the device can still function for a time in the event of a power loss. With the Omni device, organizations can save on both the cost of the device and on the cost of installation while still getting the same features and benefits of the separate communication systems. For more information, visit the Omni web page by clicking here. The recent increase in school shootings (more school children have died in the US this year as of writing than service members in the military) has also seen an increase in perpetrators making use of the school’s emergency communication system for their own nefarious purposes. The suspects at both Marjory Stoneman High School in Parkland, Florida, and at Santa Fe High School in Santa Fe, Texas, pulled the fire alarm, causing students and staff to leave their classrooms, believing there to be a fire drill. In both cases, the very systems designed to keep students safe were instead used against them. While the fire alarm is easy to access via its pull stations, it’s not the only system vulnerable to unauthorized usage. Most perpetrators of school shootings have been current or former students, or have other ties to that school. Therefore, they are more familiar with the school’s security and could know the number for the PA system and dial it, either to use it themselves or to prevent security or school administrators from using it. As more violent incidents at schools occur, the more future shooters can learn from the techniques of those who came before them. It is vital to secure the emergency communication system from unauthorized usage. While this may be impossible for certain parts of the system, such as the fire alarm pull station or even the PA, the system as a whole should be protected with user log in and passwords, as well as different classes of user to restrict which users have access to what features as needed. This in addition to using multiple methods of communication could help prevent further misuse of emergency systems. For example, if students and staff are expecting any emergencies or drills to be announced with both audio and visual PA, it would be easier to know that something was wrong and that it wasn’t a real alarm if they heard only the fire alarm. In emergency situations, audio PA alone often isn’t enough to convey emergency communications to those who need it. For example, in the recent tragic events at Marjory Stoneman Douglas High School in Parkland, Florida, one of the first acts done by the shooter was to pull the fire alarm, which caused many students and teachers to believe that there was a fire drill and leave their classrooms before a code red lockdown could be enacted. More recently, at Santa Fe High School in Texas, the fire alarm was pulled, causing students and staff to, believing there was a fire drill, go outside, where they began to hear gunshots. Fire alarms, by design, are extremely loud – the alarm could effectively nullify any attempt to communicate via audio PA. In addition, many types of emergencies could render a substantial portion of the victims at least temporarily deaf, also rendering audio communications futile. To most effectively communicate during an emergency, audio/visual PA would provide both the audio announcement but also a text announcement that would reach people unable to hear the audio for any reason. In addition, text announcements can continue scrolling, preventing people from missing important information. It’s also easier with text announcements to provide different instructions to different locations without the other messages interfering and the message getting muddled or misunderstood. Even in situations where everyone is able to hear clearly, having additional sources of communication is essential. An audio announcement alone could result in missed information if people were not paying attention quickly enough. Also, any single source of communication could see people seeking corroboration from another source. Audio/Visual PA provides two sources of communication in one and ensures that messages and information reach people in an emergency even in extremely loud environments. Additionally, if all official emergency messages and drills utilize both audio and text, then staff could know immediately that something was wrong if one was issued by itself. 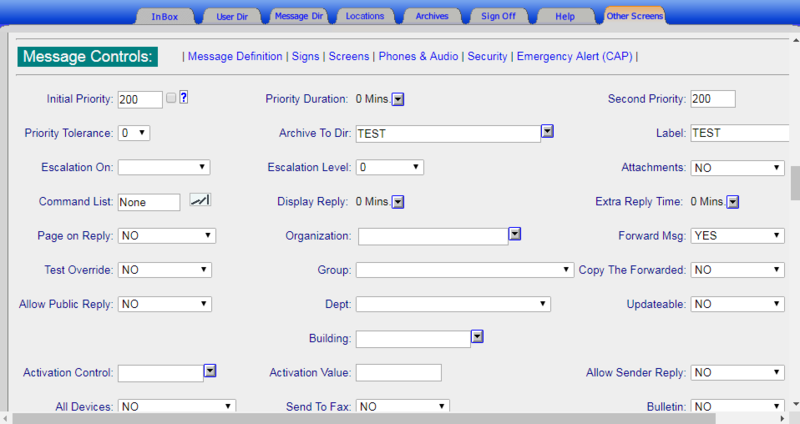 Text Device Control is where a user can set up how they want to receive messages, independent of how a message is set up. For example, a user that wants to receive all messages via e-mail, regardless of whether the messages were configured to go to e-mail, can set this up in the Text Device Control screen. 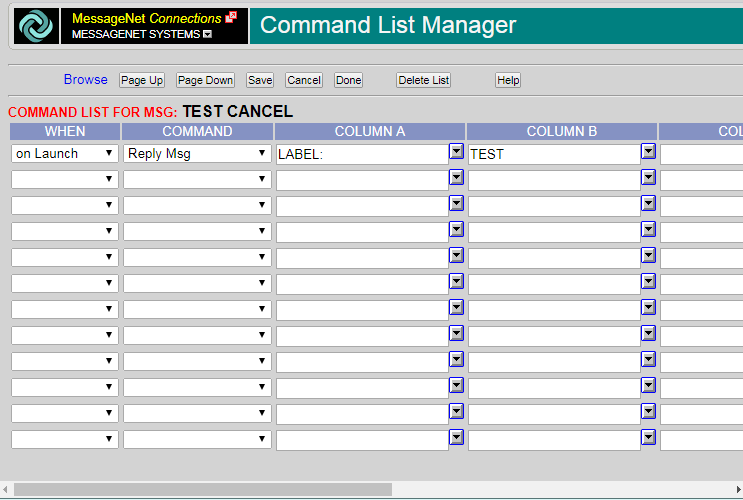 This screen appears in two locations (User Database Manager and Comm. Ctrl), but any changes made in one location will be saved in both locations. To access it, either click on the Comm. Ctrl. button in the upper right corner of the User Directory, or navigate to the User Database Manager from the Other Screens tab. Each selection has a check box and corresponds to a device or communication method that can be added to a user’s account. To select devices on which to receive all messages, check the box next to the appropriate devices. Some devices, such as pagers (the name is pager, but it can really be any text device, including cell phones), must be checked in order for a user to receive any messages on it, even if a message is configured to send to that text device. For phones, enter a 1 in the empty box next to the field’s check box. This number may differ depending on the organization’s phone system, but 1 is generally standard. The 1 instructs the system to bypass the voicemail message. This is important because the MessageNet system cannot tell the difference between a person answering the phone and voicemail picking up. If the voicemail picks up and plays its message before allowing a recording, the MessageNet system will have already played all or most of the message prior to the beginning of the recording. Entering a 1 bypasses the voicemail message so that the recording will begin as soon as the message begins playing. Users can only change their own Text Device Control settings if the User Allow Change box is checked. This box is only in the User Database Manager version of the Text Device Control and the System Administrator must check it prior to the user changing their settings. Creating and managing new users is the responsibility of the on-site System Administrator. For security reasons, MessageNet support staff cannot manage user accounts, as they have no way of knowing which users should have access to which features of the MessageNet system. Before creating a new user, the System Administrator should know what features of the system that user will need to use, so that the user account can be granted the appropriate permissions. To create a new user, navigate to the User Database Manager from the Other Screens tab. Your own user record will appear as the default. The fields that are highlighted are the fields that are required to create a user account, but only the PIN/User ID field needs to be unique. Erase the current contents of the Last Name, First Name, PIN/User ID, and Password fields and enter the correct information for the new user. Then, click Save as New. This will create a new entry (Save will override your own user account, so be careful). The PIN/User ID and Password fields will be used to log in to the MessageNet system and the First Name and Last Name fields will be used by messages and lists that the user will receive. The other highlighted fields are Directory, Sign Group, and Class. 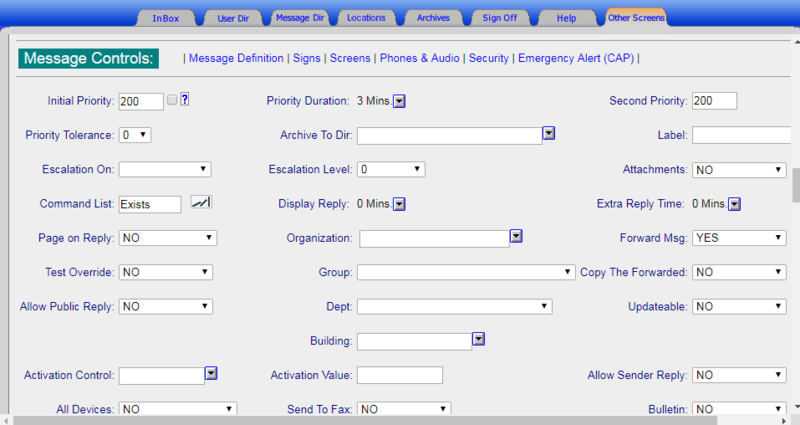 In the Directory field, select the Message Directory that the user will be need most often. For some users, there is only one message directory that they use and they thus may not know how to navigate between directories. The directory selected here will be the default directory that appears when the users clicks on the Message Dir tab. If the user has a sign that is dedicated to their use, then you can select the Sign Group for that sign so that other users can send messages to that user on their sign from the User Directory. Otherwise, this can be set to ‘No Signs’. Class is the field that controls what kind of access and permissions a user will have to the MessageNet system. System Administrators will always need to be MGR-class users. Users who need to create messages will need to be at least CL1 (the highest level of standard user), while users who only need to send messages but not create them can be CL4 (the lowest level of standard user). To see a full list of possible user classes and what permissions they entail, click on the Help tab. Scroll down to the list of fields and select Class to quickly jump to the class descriptions. There will be a comprehensive description of each user class as well as a table of the different screens and which user classes have access to them. Don’t forget to click Save after any further changes have been made. The 21st century has already seen more deaths and injuries in its first 18 years than in the entirety of the 20th century. At the time of writing, at least 13 separate incidents had occurred, causing at least 66 deaths and 81 injuries. In the 20th century, there were far more injuries, but only 55 deaths due to school shootings. The demographic of the shooters has also changed – now a school shooter is more likely to be an adolescent rather than an intruder. Researchers attributed the rise in school violence to a variety of factors, including easier access to guns for adolescents, mental health, and a lack of skills in conflict resolution. Preventing more tragedies from happening should be a priority, but even with preventative measures in place, it’s vital to be prepared for the worst. A robust emergency communication system is more important than ever to protect staff and students and to save lives. During an emergency, one method of communication often isn’t enough to convey information to those who need it. Multiple methods of communication can provide different information to different groups of people at the same time, from teachers and students in different buildings to notifying parents and emergency responders. Mass shootings aren’t exclusive to schools, either, and every organization should be prepared. There have also been more public shootings in recent years, including the one in Las Vegas. Having a plan for emergency situations and an emergency notification system to communication instructions to everyone involved is unfortunately necessary. In public locations, texts and other forms of private communication wouldn’t be able to reach most people, but audio/visual PA could still provide the necessary information and instructions. While improved communication can’t prevent emergencies from happening, it can help make the best of emergency situations when they occur.